Bowl (R) - Site de thelastchallenge ! To drink tea, you need a cup!!!! To have energy, you need a bowl!!!! The bowl: a container for the energy, a home in which the Tan Tien will feel in security, a place of transformation of the negatives energies into positive energies, and thus of increasing of the Force. 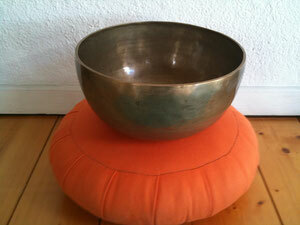 To finish the practice : make turn the forces in the bowl through the loop. « Here too, as soon as you sit on a cushion, your attention is in the belly, to be on intimate terms with this Tan-Tien. Your breathing is like a hand which seeks something in your belly, also with muscular movements, according to your seniority and ability. Whoever is well advanced perceives the TT immediately without there being a need to make a muscular or even respiratory mobilization. With the exhalation, one sends the TT onto the four points of the belt, like a tennis ball against a wall, which goes out with the exhalation and which returns with the inhalation. Four times should be normally sufficient, except for the back, at the level of the sacrum, where it is longer: one can do up to six or eight times. It is enough to have a small perception, a heat, a pain, a presence etc. There is no point in expecting a strong feeling, because if there already is a small perception, this means that it is working. Now, you push while exhaling overall, with force, on the TT, which has returned naturally into central position. You perceive the belt of energy around you. It is always there, in potential, but few people put it back into activity. Push very strongly. When you are used to it, you can push on the belt as well while exhaling as while inhaling. The beginner does this with the exhaling. You release and perceive that there is an energy reality around the belly. It is not imaginary. It is true that from here, one could already constitute the bowl with the perineum. But it is interesting to check that this is not imaginary. Therefore, you will push back very strongly onto the belt, while connecting yourself to a preoccupation that you currently have. You realize, then, that the subject cannot develop. It is not resolved, but cannot develop. Through this procedure, one has broken the link that there is between the thought and the storing away, that is to say, the memory. As thought is only the decoder of the memory, it has no more access to its computer. In this way you can block the auto-ignition system of thought which runs behind itself. This is the authentication that the belt is real. Always do this experiment which only lasts a few seconds, just to check. To constitute the bowl it will be necessary to close the perineum slightly, at the moment of exhaling, when you send the TT like a tennis ball onto it. You can release slightly with the inhaling. Releasing does not mean to say opening entirely. You throw the TT with the exhaling four times. Here you are, this heats up. You can even have sexual excitement. No problem. Once the perineum is thus enlivened, it is enough, while breathing out, to push back on the TT which has returned naturally to the centre. The belt will widen, gradually, towards the bottom, while creating a dressing of the lower belly, as much the belly side as the bottom side, to close itself at the perineum. This is the normal constitution of the bowl. I never lay too much emphasis on this constitution of the bowl, because, too often, it is regarded as very secondary, just a starting point. No! It is necessary that it is very powerful to support the remainder. It is the infrastructure, the foundations of the house. There is no point in then building super well fitted walls if the foundations are not there. One day, there will be a collapse when an emotional storm agitates you. «.....I insist ! The belt is essential. I hope that you will quickly have a very emotional disturbance to realize of this importance, only way to obtain a material certainty. The belt attracts like a magnet the perverted energies. You will observe it very physically; you “will see” with the literal sense, inside you, all this drainage towards this zone and at the same time you will notice the liberation of your thorax, of your heart and of your head. You will have once again conscience of them and you will be able to act, what you could not a minute before completely carried by the storm. The belt will have « swallowed » these energies. It will be your first noticing through the return of your will. And the second noticing will be still more extraordinary. You will notice that you are stronger than before! The belt will have not only purify your body of the perverted energy but in add it will have furnished a supplementary vigour. This benefit will besides carry you naturally to the action. «The first very important use of this belt is the brain drainage and the stop of the thought. If the eye is the decoder of the light, if the ear is the decoder of the sound, the thought is the decoder of the memory. You can check that it is impossible for you to think of something which you do not absolutely know, which you do not even know that exists, which is not inside your memory. It is impossible for you to think of it. This thought that you believe so important, is never but reactualized past, it means a memory reactualized in the present. If you want to create your future with this tool of the past: you will have a problem. The belt enables you to block the thought when it is being agitated on all the sides with your emotional system.